Designed based on feedback from users in the field, the Mini Modular Radio/Utility Pouch carries a radio or other small device securely and accessibly. MOLLE compatible and shipped with MALICE clips, it attaches tightly to the webbing on your belt or pack. The combat-proven ballistic nylon is extremely durable, easily able to stand up to heavy use in the most challenging conditions, and the high-quality zippers and tracks are built to open smoothly and reliably every time. If anything does go wrong, the pouch is also covered by High Speed Gear's lifetime warranty. 2.25" x 3.25" x 6"
Perfect fit for a Motorola 7000 radio. 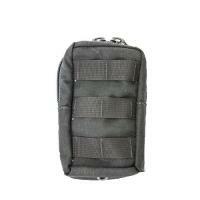 Very durable with great straps for the MOLLE.